Ugh. I’m sorry this is so overdue. While I have the best intentions, it seems I sometimes struggle with managing a household, school and maintaining sites. This has been put off, as I wanted to take my time and write a thoughtful post. Time however is a scarce commodity these days. Exams and quizzes seems to follow right on top of one another, and free time has been consumed with errand running and cooking. Hopefully, I’ll get some time over the holidays to get to some of the many projects that I have lined up. Fingers crossed any ways. 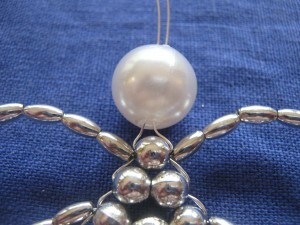 At any rate, here is a brief overview on how to make a beaded angel ornament. We’re going to start with the basics here. 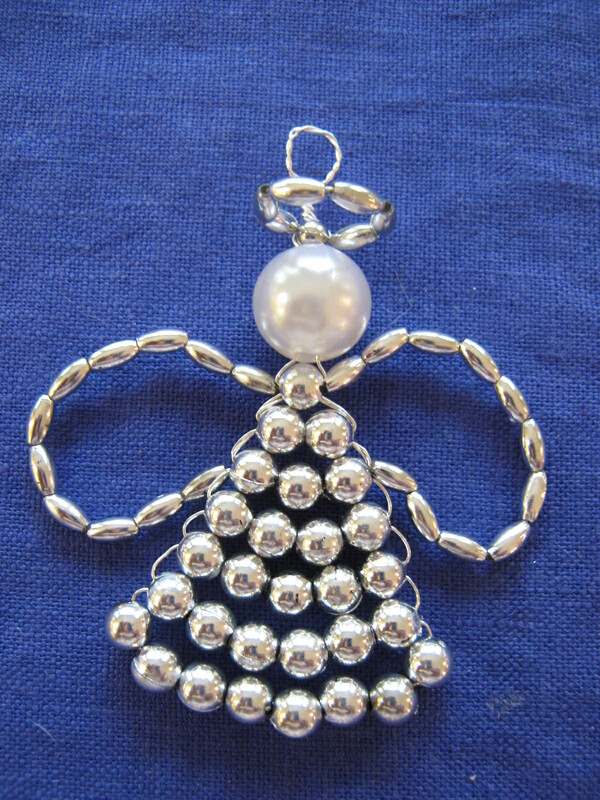 This particular Angel ornament was made by cross weaving through the beads. This is a technique thing. 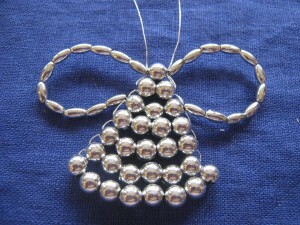 Not only can you use this technique to make an angel ornament, but you could easily adapt it to make a tree ornament, or even a cross . Once you get the first two rows of beads, it’s a breeze. 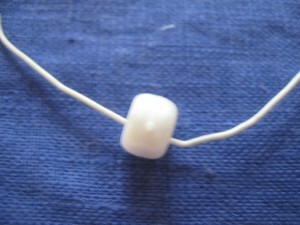 This bead represents a row. 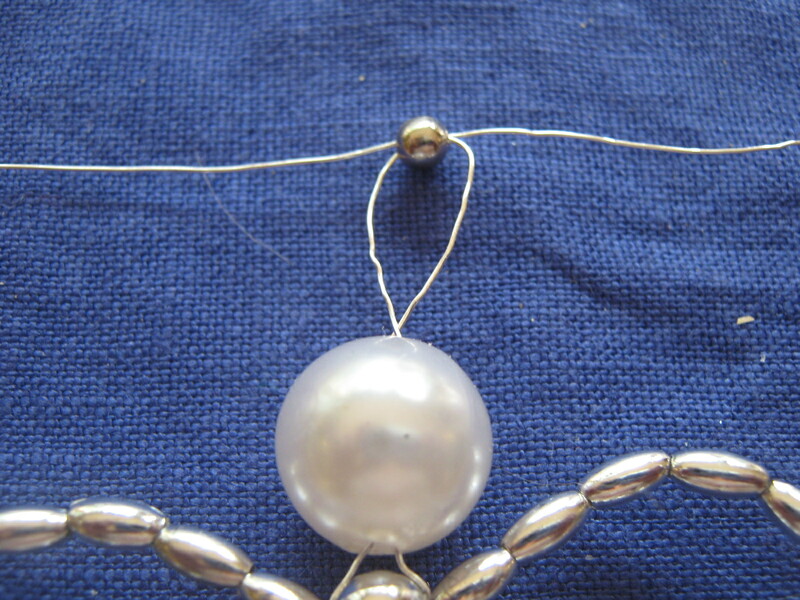 Thread your bead on and center it on the wire. This is obvious as there are only two beads, but you’ll want to make a note as to how many beads you’re putting in each of the first two rows. I’ve split them up to simplify it, but if you wanted 5 beads in the first row and 4 in the second, you’d simply thread on 9 beads, and then run the wire across through 4 of them. All your doing is crossing the wires through the beads, one row at a time. SO, if you thread your second row of beads on the left side of your first row, pass the wire that is on the right side through the beads you just added, going in the opposite direction. Once you snug up (pull tight) your wires you will begin to see the rows form. That’s really all there is to making the dress for the angel. There’s a lot of freedom in making ornaments this way. 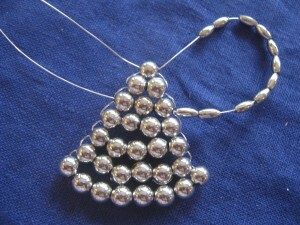 I make my ornaments for the site with inexpensive craft beads. It seems like it’s feast or famine here. When I make Christmas ornaments for the site, I usually do several at a time. I have more ornaments than I do space on my tree so I don’t always keep them. However, you can use pearls or even swarovski Crystals if you like. Swarovski does an incredible job of catching the light on the tree. I have some snowflakes that I made with silver and crystal and they are truly something special. If you are looking for something to do as a class project, go with something less expensive. 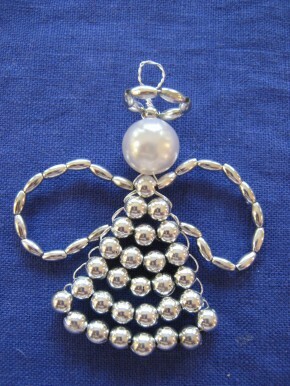 I’m using craft quality beads from my local hobby store to make this angel ornament. Size doesn’t really matter so much. Don’t use beads that are too heavy for the wire. 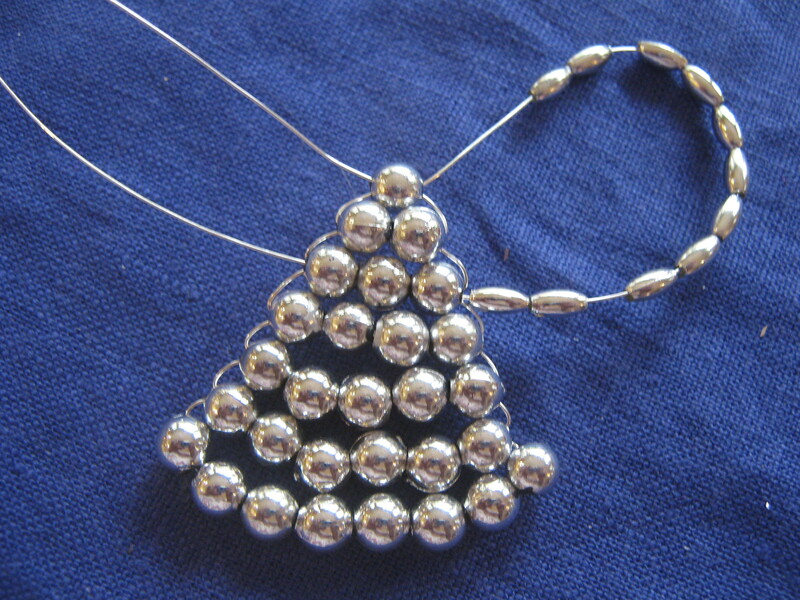 The size and number of beads that you use will determine the size of the finished ornament. 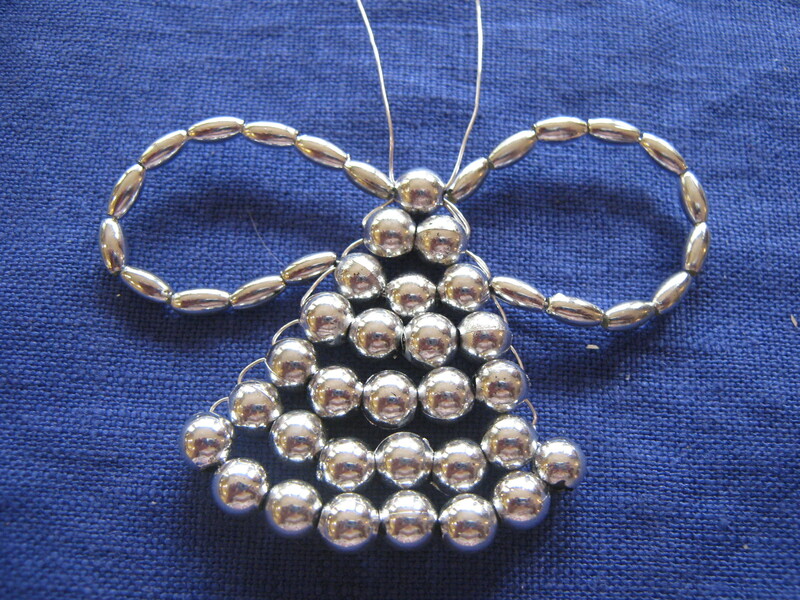 With a little creativity you could make a set small enough to wear as earrings. I have 8 beads in my first row, 6 in my second and 5 in my third. The last one on the first row is a bit wonky, I probably should have gone with 7. When you get to the top you need to think about how you are going to do your wings. I opted for the inexpensive oat shaped craft beads, but you can use whatever ones you want. You may need to play with them a bit to get wings that are an appropriate size for your angel. I think the wings look best with smaller beads. Add your wing beads, and then weave the wire through the third row. You have 2 options here. If your wires are fairly evenly spaced, you can weave the wires back up to the top. If one wire is longer, you can use it to make both wings. Once you’ve taken the wire through the third row, you’ll just add the second set of wing beads and cross it though the top bead. Either way, the end result should look something like this. I’m ok with the rounded angel wings, but the neat thing about working with wire is that bend it to your will. If you do want to shape your wings a bit more, this is a good time to do it. 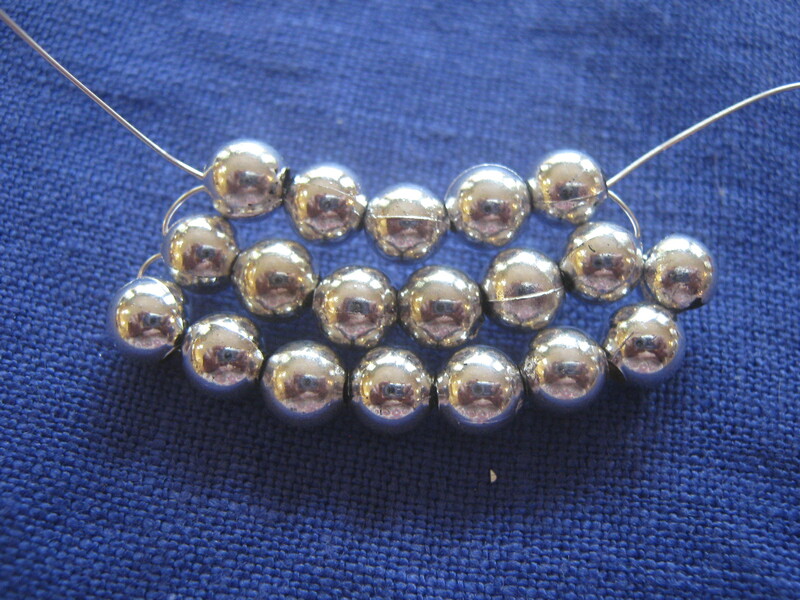 That way, if you decide that you need more, or less beads you can easily modify them. Once you start wrapping the wire changes become much more difficult. This is the easiest step. You’ll want to give your Angel a head. 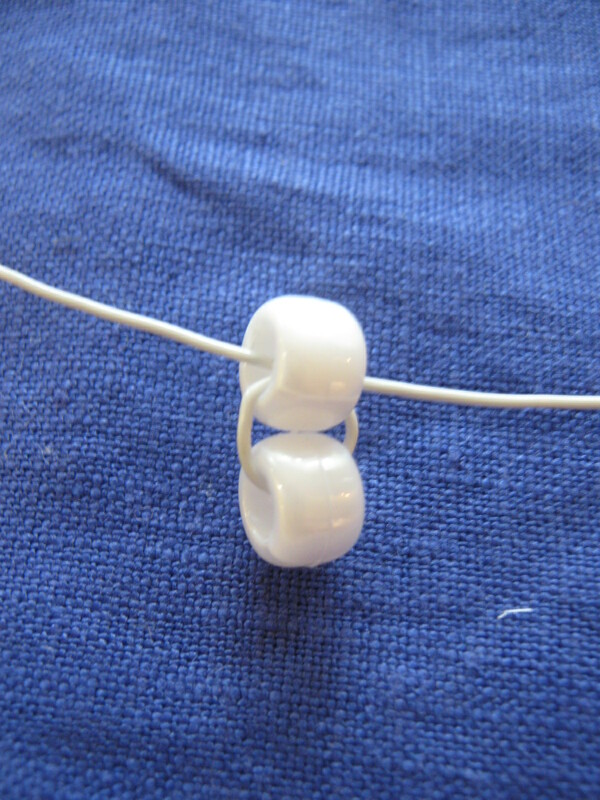 Just take both wires and run them up through an appropriately sized bead. There are several ways that you can add a halo to your angel, I’ll show two. 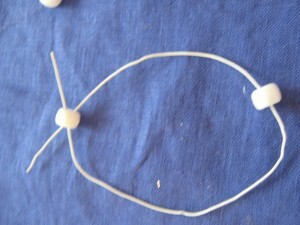 To do it this way, you leave a bit of open wire, add your halo beads, and give them a twist to hold them fast. Take the other wire and make a loop to hang the ornament from. (not shown) You’ll want to twist the wire around itself at the bottom to hold it fast, and trim off the extra. Then take the other wire (from the halo) and wrap it snugly around all of the wires between the halo and the angels’s head. Clip off any extra wire. I accidentally cut mine too close, severing the wires. So I don’t have a finished angel to show you. 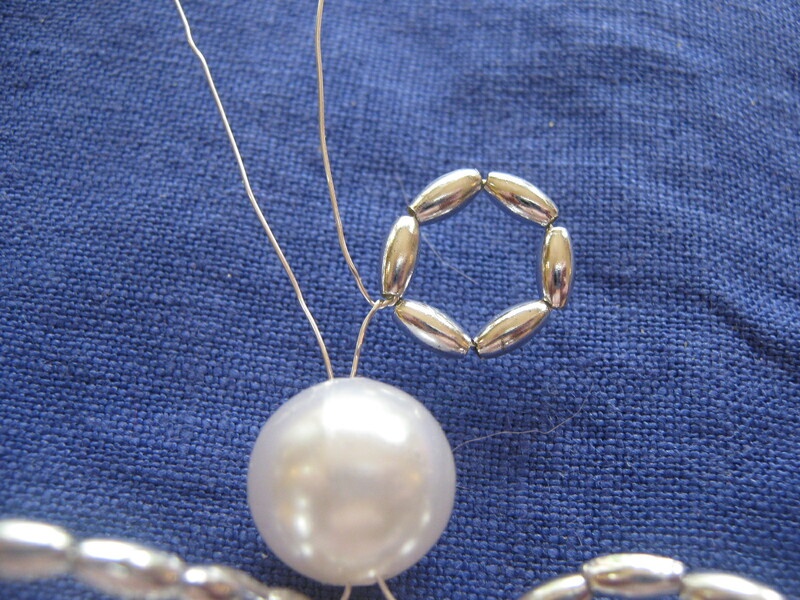 In the second method, you’ll take those two wires that are exiting your angels head and cross weave them through a small bead. This does two things. First, it holds everything in place. 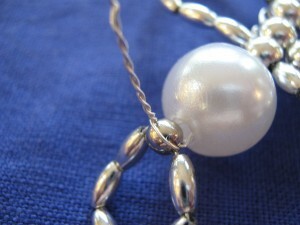 As you tighten up the wires, it pushes the Angel’s head down snugly against the body. This makes things a bit more manageable while you are assembling the halo. Second, it gives you a bit of space between the angel’s head and her Halo. I think this looks a bit better. The first time I tried this I just went straight from the head bead to the Halo. It just didn’t look right. Add the halo beads to one of the wires and then pass it back through the anchor bead. You’ll have one wire exiting each side of the bead. Of the two halo methods, this is the one that I prefer. The only things she needs now is something to hang her by. Once they are twisted nicely together, make a loop to hang her. 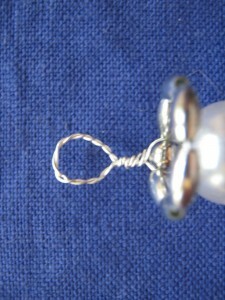 Take the extra wire and wrap it back around the base, then trim. 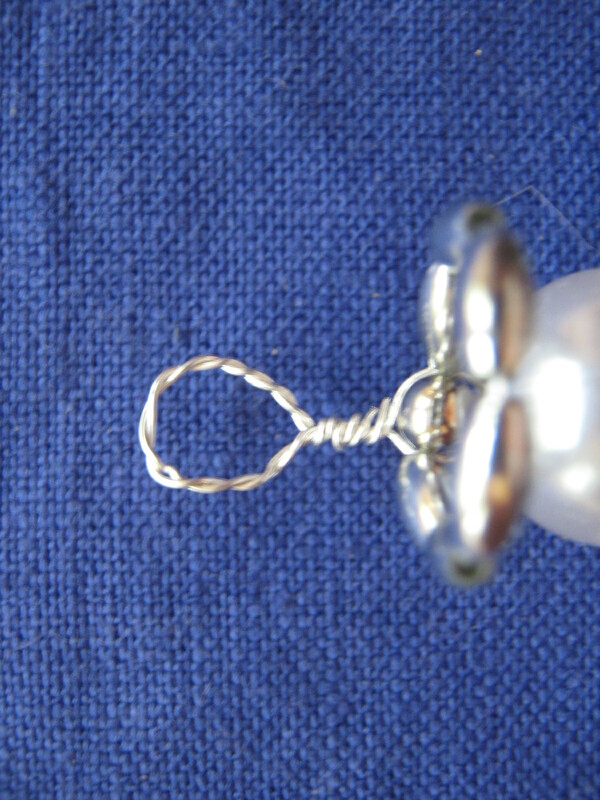 This is a simple wire wrapped loop, you are just making it with two wires that have been twisted together. You can either make or purchase a wire ornament hanger. Just attach it to the loop and she’ll be ready to hang on the tree. You can also use a pretty piece of ribbon, which is the way I usually go. These angel ornaments are easy to personalize. 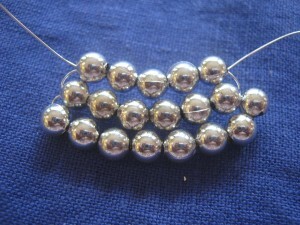 I like the silver tone beads as they looked nice on the blue and white themed tree that I had a few years back. You can make the angel’s dress out of any color that you like to tie it in to your own holiday decor. Once you’ve made one of these, they go fairly quickly. That makes these little angel ornaments a good choice if you want to add a little something to a wrapped gift. Just thread your ribbon through the loop before you make the knot for your bow. 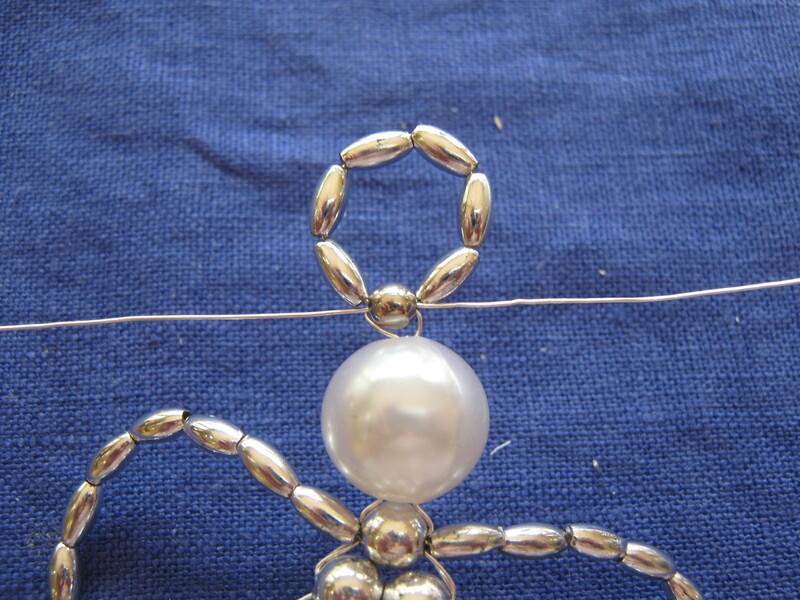 How much wire to you begin with when making this angel? I want to use 9 beads at the bottom and work my way to one. 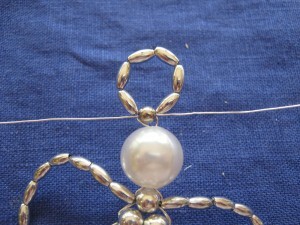 What length wire do I cut to begin the work to finish the angel without having to add more wire? Also, have you ever make one with arms in addition to the wings and halo?